Twitter user @training_medic shared the most awful story on his timeline, detailing how he lost his patient to a pastor’s unreasonable’s beliefs. 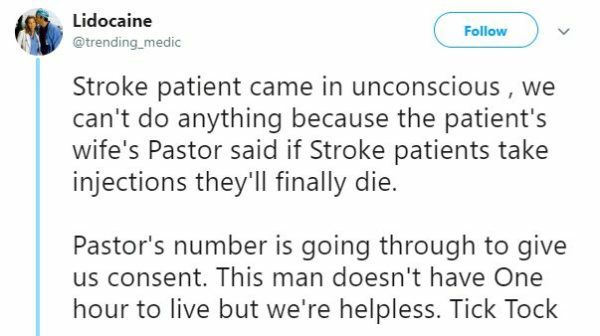 A patient had been brought in unconscious after suffering stroke, he shared, but the doctors were unable to act because the patient’s wife’s pastor had said stroke patients die when they take injections. They had found it impossible to reach the pastor, he shared, and when he finally picked his calls, he ordered the doctors not to act until he arrived. Ultimately, they lost the patient, and only after that had the doctor arrived.